For over two thousand years doctors would puncture their patient’s veins and let them bleed out in order to rid them of their diseases. Today we laugh at the practice of bloodletting. Two hundred years ago we would measure a person’s skull and use the results to determine if they were smart or if they perhaps had criminal tendencies. Today we laugh at Phrenology. Did you know that the two things managers hate most are firing people, and doing performance reviews? And the two things employees hate most are being fired, and performance reviews. Why? Because everybody knows they are awkward, contrived and a huge waste of time. Here are 4 reasons why the annual performance review—as it’s traditionally practiced—is an evil, toxic ritual that must be abolished. The annual schedule is an enabler of delayed feedback. I am a non-confrontational introvert by nature. I was a bad boss who hated giving feedback. I remember thinking once, “Wow, Sameer really messed up. I should talk to him about his performance. But (here come my excuses) we’re all so busy, and he’s going to get so upset, and we’re on a tight deadline and I don’t want to disrupt the momentum. Hey, his performance review is only 10 months away. I’ll just hold on to this incident and zing him with it at his review.“The truth is that managers don’t take notes throughout the year on their direct reports’ performance. So annual reviews tend to be comprised of just the stuff they remember, which is only the stuff that occurred recently. They are based on preset, generalized “standards” that are vague and subjective. 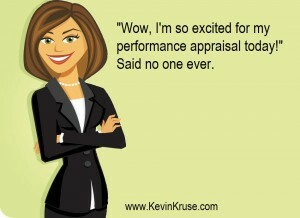 Just do a Google search on “performance review standards” and let the hilarity begin. Perhaps you’ve encountered: Initiative, Creativity, Problem Solving, Knowledge of Work, Quality, Organizational Skills, Professionalism, Motivation. What do these things really mean and what are the odds that managers across the organization are interpreting them in the same way? Is there any proof that the standards on the performance review correlate to specific job performance? The appraisal is tied to compensation. People love feedback when it makes them better and gets them closer to their goals. But receiving constructive criticism that drives the size of your raise down can only be greeted with fear and disappointment. Also, for the managers who have hearts, they don’t want a silly review system to negatively impact someone’s take home pay. So they artificially inflate the scores and comments on the review, which of course, helps nobody to get better. Don’t misconstrue my attack on the performance review process as an attack on HR. I only hate the corporate vampires who pretend to be HR professionals so they can defend half-century old notions that drain our souls. I actually love the true HR professional who gets it—the passionate fighter who is focused on maximizing talent and creating workplace super heroes. These HR leaders are our hope. They—and their C-level colleagues—are the ones best suited to battle the status quo and lead us to the Promised Land.